THE “2015 SMOKE ON THE COAST” EVENT WINNER! 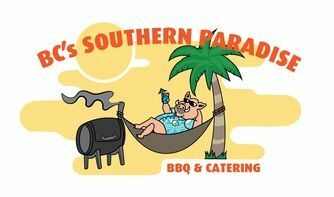 Everyone loves good BBQ and in the Florida Panhandle you won’t find a better smoked BBQ than BC's Southern Paradise BBQ & Catering. BC’s is your one stop shop for great affordable Bar-B-Q. We promise a great plate of food that won’t empty your wallet. Big Country's 100% Satisfaction Guaranteed! Too many Bar-B-Que catering services have begun charging far too much for classic dishes. But not BC’s Southern Paradise BBQ and Catering. We’re still serving up great classic Bar-B-Que dishes at low costs to our great customers for their events. When you come to BC’s Southern BBQ & Catering, you know you’re coming to a Barbecue caterer that means business. We’ve been competing against the big Barbecue chains and BC's always comes out on top. We guarantee that we’ll always beat out those other guys. We wager our Barbecue is better than Sonny’s BBQ, Dickey’s, Kinfolk, and even Hub City. And we aren’t just bragging; anyone who’s ever eaten at a BC’s Southern Paradise BBQ and Catering will agree. They are offering top-quality catering services for all types of Palm Beach events as well as sophisticated event planning and preparation in Palm Beach and the surrounding areas.